Electroformed metal bellows manufactured by Servometer are utilized for metallic hermetic seals, volume compensators, pressure and temperature sensors, flexible connectors, and countless other applications where quality, dependability, and long life are critical requirements. Metal bellows manufactured by electrodeposition create flexibility, protection, motion, and balance for systems requiring precise, repeatable results. 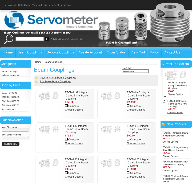 Servometer is the foremost manufacturer of electrodeposited bellows. Electrodeposited (or electroformed) bellows are available in various materials to ensure the proper design for anapplication. Our electrodeposited (electroformed) bellows are lightweight, seamless, leak tight, flexible and repeatable. Standard sizes are available through our FC Bellows product line. Servometers experienced engineering and manufacturing staff can design and assemble finished components to simplify your installation and increase performance. Versatile metal bellows play an essential role in controlling pressure, vacuum and motion, and more in a broad array of machine components and assemblies across numerous industry sectors. DESIGN ENGINEERS with precision rotary motion requirements such as instrumentation and fractional horsepower applications often choose electrodeposited nickel bellows because of their high performance characteristics like positive displacement , zero windup and low or minimal backlash. Servometer’s compact bellows couplings accommodate more than 30 times the angular misalignment and 15 times the compression or extension tolerated by other types of couplings. Electroforming is the process of depositing thin layers of metal onto a mandrel through electroplating, dissolving the mandrel chemically, and leaving the plating as the final electroformed product. This white paper illustrates how electroformed components are manufactured and how they can be applied to a variety of applications.